A short drive from your Anaheim hotel is the famed Long Beach where a five-acre aquarium awaits. Full of fun and adventure, the Aquarium of the Pacific is located at 100 Aquarium Way. The biggest aquarium in the world includes over a dozen permanent exhibits including Frogs: Dazzling and Disappearing, Jellies, the Sea Otter Habitat, and the June Keyes Penguin Habitat. Open daily, the Aquatic Academy and Climate Forum offers workshops and guest speakers year-round for all ages. For Anaheim visitors in town for an extended stay, check out the summer camps for little ones and special exhibitions like Whales: Voices in the Sea or the Northern Pacific Gallery. Special behind-the-scenes tours and cruises are available. July is a busy season, so buy your tickets online and in advance. 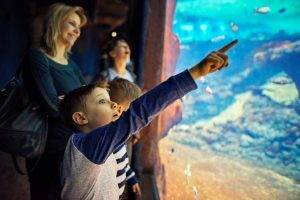 Special Aquarium for Adults and Aquarium for Families events and nights are set aside so you can customize your undersea experience. Ask about animal encounter options and specials for hotel guests. A big part of the Aquarium of the Pacific’s mission is conservation and education. Visiting the aquarium helps with numerous initiatives such as sea turtle monitoring and climate resiliency. Plan your trip today.